Palisades Vineyard is located off of Palisades Road directly below the high cliffs of the Palisades in a narrow riparian canyon one mile north of the town of Calistoga. Inky dark color with aromas of dusty blue and black fruits, dark plum, licorice and purple flowers. A clean, bright entry leads to flavors of black currants, quince, boysenberry and baking chocolate. The wine manages to retain a sense of refinement while coating the entire palate with deep structured tannins. … rich, intense and black as it can be. There are loads of black fruits, tar and unsmoked tobacco. The oldest vines on the property (Block 11) were planted in 1968 by Frank Barberis. This 1.6-acre block of Petite Sirah grafted on St. George rootstock replaced Petit Sirah vines planted by his father (see photo of original vines). Frank replanted additional blocks to Petite Sirah in the early 1970s. Today, 11.3 acres of the old vine, head trained Petite Sirah are dry farmed in the tradition of the original farm. In addition to Petite Sirah, Palisades Vineyard is planted to Petit Verdot (0.9 acres), Cabernet Sauvignon (4.2 acres), Cabernet Franc (0.4 acres) and Chenin Blanc (0.5 acres). The Cabernet Sauvignon, Cabernet Franc and Chenin Blanc were planted between 2015 and 2018 by the current owners. The Cabernet Sauvignon was field grafted from budwood with historical roots in Napa Valley (Eisele and Inglenook). All of the new vines were grafted onto St. George and 110R rootstock. Adhering to the historic nature of the vineyard, all of the new vines are head trained and planted on an 8’ x 8’ grid. The owners’ intent is to dry farm these vines once they have been established. 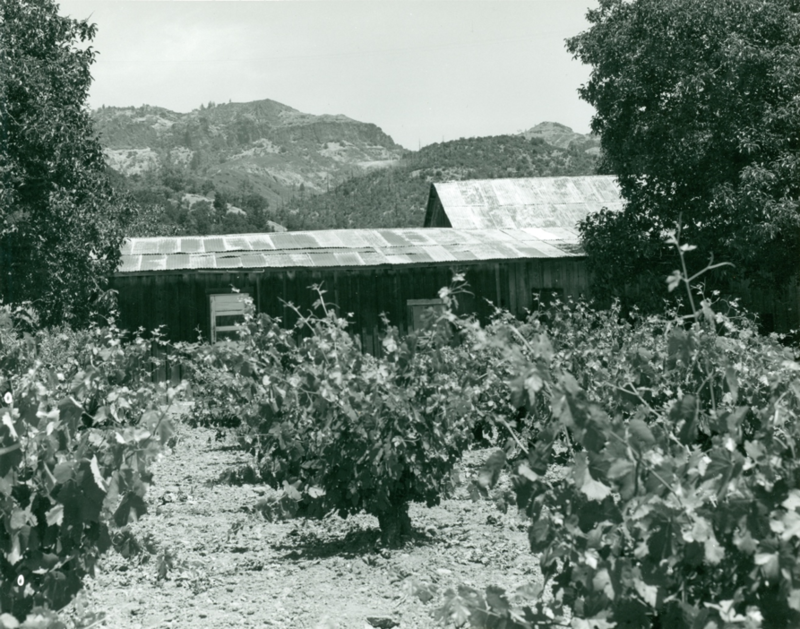 Vineyards have been planted on the property since at least 1878 when it was owned by James Horn, an immigrant from Scotland. A property deed signed by Horn mentions his vineyard along the road that bisects the property. In 1907 the property was purchased by Domenico Barberis, a recent immigrant from Liguria, Italy. Domenico and his wife Gilda planted the farm to grapes and plums and their family farmed the property until the early 1990s. According to the family, Petite Sirah has been the dominant grape on the property since the vineyards were first developed by Domenico, although the family grew other varietals as well. In approximately 1915, Domenico built a winery on the site (see photo) and bonded it as Bonded Winery No. 118. Domenico maintained his bonded status until 1932, losing it 10 months before the end of Prohibition. The old winery still stands. The Barberis family farmed the property until the early 1990s. 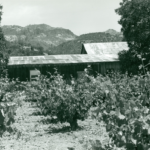 From 1992 until 2015 the property was owned by Anne Carver and Denis Sutro who made wine from their Petite Sirah grapes under the Carver Sutro label. Photo of Bonded Winery No. 118 and original vines planted by Domenico Barberis. Vines planted in 1968 by Frank Barberis used budwood from these vines. Photo from the archives of the Sharpsteen Museum.